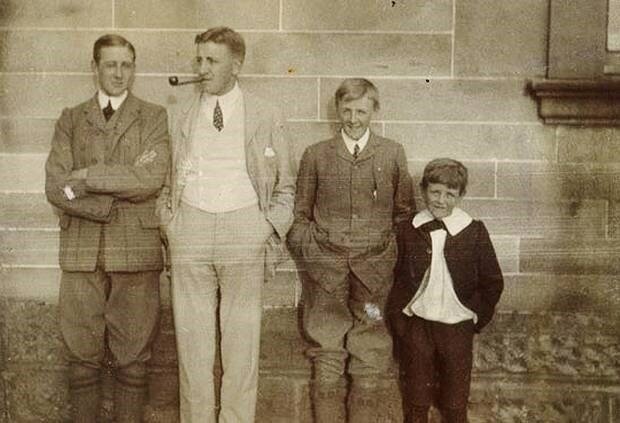 Lt Col William Herbert Anderson - Bertie - was an army reservist who had followed his father into accountancy, commuting to the family firm in Glasgow from Cardross, where he lived with his wife Gertrude and sons. 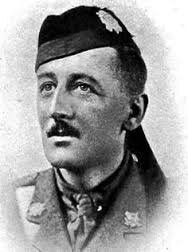 Bertie was Commanding Officer of the 12th Battalion, The Highland Light Infantry. Records describe him as a 'genial and cultured gentleman' who died 'fighting within the enemy's lines'. He died on 25 March, 1918, at Maricourt, France, in the second of two counter-attacks he had led that day. He was awarded the Victoria Cross. He is buried in the Peronne Road cemetery just outside Maricourt. Alexander Ronald - Ronnie - was the second Anderson son. He was farming in Rhodesia when war broke out, but enlisted, joining Lovat's Scouts. He was commissioned into The Highland Light Infantry, reaching France in May 1915. He was shot in the trenches on 8 October, 1915 at Vieille Chapelle. He is buried at Cabaret-Rouge British Cemetery at Souchez, France. Today this cemetery contains over 7,650 burials of the First World War, over half of which remain unidentified. Charlie was born in 1888. He was the fourth son and a career soldier, joining the 1st Battalion, The Highland Light Infantry, in Lucknow, India, in 1908. He arrived in the trenches near Givenchy on 12 December, 1914. On 19 December, Charlie took part in an assault on the German line. At first it was successful, capturing the enemy trench, but the Germans counter-attacked and his company was cut off. Under cover of darkness, only a handful of survivors returned. Charlie was not among them. Like so many, his body was never found. He is commemorated on The Le Touret Memorial which commemorates over 13,400 British soldiers who were killed in this sector of the Western Front from the beginning of October 1914 to the eve of the Battle of Loos in late September 1915 and who have no known grave. Teddie, too, joined the HLI, but in 1915 he transferred to the Royal Flying Corps, the fledgling precursor to the RAF, and arrived on the Somme in May 1916. He saw action at the Somme, but his talent as a pilot saw him promoted to instructor in Winchester, in the south of England. He too gave his life to the war, in a plane over Winchester on 16 March, 1918. Teddie was the only one of the four soldier sons to 'come home' - he was buried in Bearsden, his father's childhood home. ​2nd Lieut T Bell, Canterbury Regiment, New Zealand Expeditionary Force, son of Thomas and Jessie Paterson Bell, of Lower Largo, Fife; husband of Marjory Rattray Conolly Bell, of Croft Dyke, Ceres, Cupar, Fife died 2nd Oct 1918 age 27. Buried at Romeries Communal Cemetery Extension, France. There are now 832 burials and commemorations of the First World War in the extension. ​Lance Corporal Andrew Bisset, Australian Infantry, A.I.F. 56 th Bn was son of Andrew and Eleanor Taylor Bissett, of Lower Largo. Died 17th Oct 1917 aged 27 and is commemorated at Ypes (Menin Gate) Memorial, , which bears the names of more than 54,000 officers and men whose graves are not known. Corporal Tom Bisset, Cameron Highlanders, died 23rd July 1916, age unknown. He is commemorated at the Thiepval Memorial. The Thiepval Memorial, the Memorial to the Missing of the Somme, bears the names of more than 72,000 officers and men of the United Kingdom and South African forces who died in the Somme sector before 20 March 1918 and have no known grave. 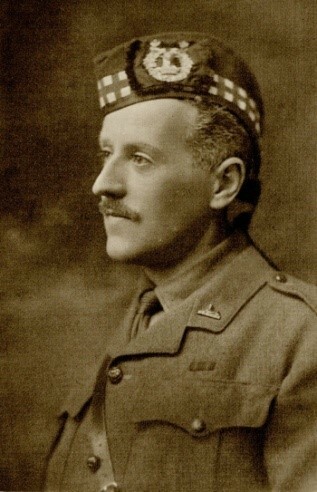 ​Captain Arthur Desmond Briggs ,Cameronians (Scottish Rifles) Son of Lt. Col. J. A. Briggs and Emily A. S. Briggs, of Strathairly , died 25th Sept 1915, aged 20. Commemorated on Loos Memorial , France, which commemorates over 20,000 officers and men who have no known grave, who fell in the area from the River Lys to the old southern boundary of the First Army, east and west of Grenay. ​Trooper John McQueen Bruce, Canterbury Mounted Rifles, New Zealand Expeditionary Force, son of James Bruce, of Gallowhill, Kennoway. Died 31st March 1918 aged 26 and is buried in Jerusalem War Cemetery. There are now 2,515 Commonwealth burials of the First World War in the cemetery. 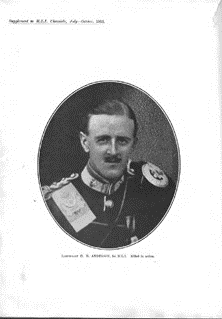 ​Major Charles Julian Maitland Makgill-Crichton of Monzie, Crieff, and Largo, was born at Folkestone, the elder son of David Maitland-Makgill-Crichton, of Rankeillor, and Emily Maitland-Makgill-Crichton. On the outbreak of war he volunteered for service and on 20th September was gazetted Captain of 6th Battalion Cameron Highlanders, although the following March he briefly transferred, with the temporary rank of Major, to 11th Battalion Gordon Highlanders. He went to France, with the 10th Battalion, on 7th July 1915. He fell at Loos on 25th September 1915 during the Battle of Loos and Hill 70. He had command of Hill 70 on that morning, which he handed over later to the colonel of another regiment. He and Major Barron, of the 7th Camerons, then volunteered to go forward to order the retirement of 300 or 400 men who had gone into the advanced trenches, and were in a very precarious position. To reach these, the two officers had to go down an exposed part of a hill, and had to face a scathing machine-gun fire. He went forward with his pistol in one hand and his walking-stick in the other, when he was struck down by a bullet. He was last seen by most on the top of Hill 70 at 10 a.m. on the morning of the 25th September, "Coolly directing operations with his walking-stick". Owing to the advanced position held at the time he fell - the Germans coming up almost immediately, and retaking that part - his body was not recovered. He is commemorated on the Loos Memorial, which commemorates over 20,000 officers and men who have no known grave, who fell in the area from the River Lys to the old southern boundary of the First Army, east and west of Grenay. 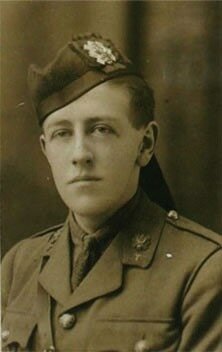 Lieutenant Douglas Gilmour, 7th Seaforth Highlanders, son of Sir John Gilmour, 1st Bart., of Montrave,; husband of Doris Hyacinth Gilmour, of Pontarfran, Brecon. Died 16th Feb 1916 aged 26. Buried at Bailleul Communal Cemetery Extension Nord, France which contains 4,403 Commonwealth burials of the First World War. Private Robert Guthrie, 16th Bn Royal Scots, born Largo. Died 9th April 1917, age unknown. Commemorated on Arras Memorial , France, which commemorates 34,785 soldiers of the forces of the United Kingdom, South Africa and New Zealand, with no known grave, who died in the Arras sector between the spring of 1916 and 7 August 1918. Corporal Thomas Lister, Royal Scots, son of William Lister, of Carberry Rd., Leven; husband of Janet Lister, of Emsdorf St., Lundin Links, Died 11th August 1916, age 31. He is commemorated at the Thiepval Memorial. The Thiepval Memorial, the Memorial to the Missing of the Somme, bears the names of more than 72,000 officers and men of the United Kingdom and South African forces who died in the Somme sector before 20 March 1918 and have no known grave. Private P Melville 9th Bn Black Watch, was the brother of David Melville, Crusoe Gardens, Lower Largo.He died 26th Aug 1917, aged 32 and is buried in Mendinghem Military Cemetery, Belgium. There are now 2,391 Commonwealth burials of the First World War in this cemetery and 52 German war graves. Private David Oswald, Royal Scots Fusiliers, was the son of Thomas and Jane Oswald, of Largo; husband of Joan Oswald, of, 7, Bourtree Terrace, Largo. He died on 15th Dec 1917 aged 35 and is buried in Ramleh War Cemetery. Ramla, Israel. Ramleh War Cemetery contains 3,300 Commonwealth burials of the First World War, 964 of them unidentified. ​Sapper Robert Kirk Philp, Canadian Overseas Railway Construction Corps, was son of Alexander and Helen Philp, of The Mount, Largo, Fife, Scotland. Born at Burntisland, Fife. He died on 26th June 1918 aged 33. He is buried in Fienvillers British Cemetery, Sommes, France. Fienvillers British Cemetery now contains 124 First World War burials. Private David Porteous. 17th Bn Highland Light Infantry, was the son of John and Rebecca Porteous, of Haddington, husband of Jane Porteous, of Nurse's Cottage, Lundin Links. He died on 18th Nov 1916 and is buried in New Munich Trench British Cemetery, Beaumont-Hamel, Somme, France. ​Munich Trench was occupied by the 51st (Highland) Division on the 15th November 1916; New Munich Trench was dug on the previous night by the 2/2nd Highland Field Company and a company of the 8th Royal Scots, and lengthened by the 8th Devons in December. There are now nearly 150, 1914-18 war casualties commemorated in this site. Of these, almost 20 are unidentified. All fell in the period November 1916, or January 1917, and the majority belonged to the 10/11th, 16th or 17th Highland Light Infantry. Private Thomas L L Rattray , 1st/6th Bn Black Watch, was the son of Andrew F. Rattray, of Largo; husband of Mary Young Rattray, of Scarasta, Lower Largo. He died on 26th Oct 1918 aged 28 and is buried in Maing Communal Cemetery Extension, Maing, France. There are now over 80, 1914-18 war casualties commemorated in this site. Lieutenant Robin Blackwood Ritchie was the son of Robert Blackwood Ritchie who was born in Scotland in 1861 and came out to Australia as a young man in 1886 to take possession of the magnificent Blackwood estate from his predecessors. Robert Ritchie married Lillian Ross, a grazier’s daughter. She bore him two sons; Robin Ritchie born in 1892 and Alan Blackwood Ritchie born in 1895. When Lillian died at the family estate in 1897 Ritchie took his two sons, just toddlers, to Scotland to be raised by his mother, Janet. The boys then attended East Sheen public school at Eastbourne, England. With the outbreak of war in August 1914 Robin joined the Army. He received a commission in Kitcheners’s Second Army serving as a second lieutenant in the 4th battalion, Scottish Rifles. In June Robin engaged in some heroics that merited the subsequent award of the Military Cross. It was awarded in the field by General Munro. In a reconnaissance mission on the German lines probably undertaken at night he shot two of the enemy with his revolver and captured another. Acting Captain Robin Ritchie was fatally wounded in a raid upon the German lines near High Wood early in the morning of July 20, 1916. Leading his 5 company he was shot by a machine gun, fell to his knees and had just enough vitality to gasp out ‘I’m hit, go on men!”. Robin’s grave was where he fell; it was soon blown to smithereens. He is commemorated at the Thiepval Memorial . The Thiepval Memorial, the Memorial to the Missing of the Somme, bears the names of more than 72,000 officers and men of the United Kingdom and South African forces who died in the Somme sector before 20 March 1918 and have no known grave. ​Private David Robertson 2 Bn Cameron Highlanders was the son of Agnes Robertson, of Station House, Lundin Links. He died on 3rd Oct 1916 aged 22 and is buried in Struma Military Cemetery, Greece. Struma Military Cemetery contains 947 Commonwealth burials of the First World War, 51 of them unidentified. There are also 15 war graves of other nationalities. Sergeant Edward D Smith , 1st/6th Bn Highland Light Infantry, was the son of Charles and Agnes Smith, of "Berwick View," Lower Largo.He died on 1st Oct 1918 aged 22 and is buried in Cantaing British Cemetery, France. Cantaing was captured on the 21st November, 1917, by the 51st (Highland) and 6th Divisions, with Cavalry and Tanks. It was held against attack on the 1st December, but given up a few days later. It was recaptured at the end of September, 1918, and the British Cemetery was made by the 52nd Division Burial Officer immediately after. There are now nearly 70, 1914-18 war casualties commemorated in this site. ​Private James Wann, B Coy , 8th Bn Black Watch, was the son of James and Mary Wann, of Montrave Farm. He died on 30th March 1916 aged 20, and is buried in Bailleul Communal Cemetery Extension, France which contains 4,403 Commonwealth burials of the First World War. 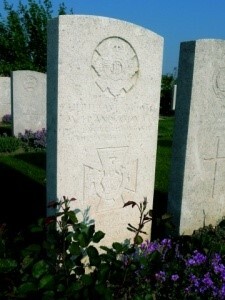 ​Private Robert Wann, 14th (Fife & Forfar Yeomanry) Bn, Black Watch, was the son of James and Mary Wann, of Montrave Farm. He died 15th April 1917 aged 25 and is commemorated on the Mikra Memorial, Greece, commemorating almost 500 nurses, officers and men of the Commonwealth forces who died when troop transports and hospital ships were lost in the Mediterranean, and who have no grave but the sea. He was on HT "Arcadian" which was was torpedoed and sunk on 15 April 1917, 41.5 kilometres north east from the island of Milo (Melos), carrying reinforcements for Egypt. ​Private A W Welsh, 16th Bn Canadian Infantry, was the son of John Welsh, of Lower Largo. He died on 22nd Apr 1915 and is commemorated at Ypes (Menin Gate) Memorial, which bears the names of more than 54,000 officers and men whose graves are not known. Gunner James Alexander Williamson, 289th Siege Bty Royal Garrison Artillery, was the son of David Williamson, of Leven, and husband of Helen Williamson of Temple Crossing, Lower Largo. He died on 6th July 1917 aged 35 and is buried in Bailleul Communal Cemetery Extension, France, which contains 4,403 Commonwealth burials of the First World War. ​Private James Simpson Wilson, 1st Bn Black Watch, was the son of John and Margaret Wilson, of 8, Drum Park, Largo. He died on 30th Sept 1918 aged 25 and is commemorated on Vis-en-Artois Memorial, France. This Memorial bears the names of over 9,000 men who fell in the period from 8 August 1918 to the date of the Armistice in the Advance to Victory in Picardy and Artois, between the Somme and Loos, and who have no known grave. Lieutenant John Arnold St Clair Anstruther, 6th Dragoon Guards (Carabiniers) was the only son of of Charles Frederick St. Clair Anstruther D.S.O., M.V.O. (late Commanding 2nd Life (Guards) of Charleton and Agnes Dorothea Guthrie. He was Aide-de-Camp to Governor-General of Australia in 1914. He died on 39th Oct 1914 aged 25 and is commemorated at Ypes (Menin Gate) Memorial, which bears the names of more than 54,000 officers and men whose graves are not known. Private William Peden, 8th Bn Black Watch, was the son of Mr. and Mrs. J. Peden, of Little Dumbarnie, He died on 13th Dec 1915 age 31. He is buried in Rocquigny-Equancourt British Cemetery, Somme. The cemetery contains 1,838 Commonwealth burials and commemorations of the First World War. Plaque erected by crew of the Royal Navy light cruiser, H.M.S. Dunedin in memory of Boy Seaman Richard Muckersie who was lost overboard in Sept. 1939. The Dunedin was torpedoed in the South Atlantic on 24 Nov. 1941 with the loss of 419 men and 67 survivors.